On my way to work every morning, I pass by The Wing Company. Though, I have yet to try their wings, I was drawn into the place by their sign advertising burgers. $6.99, burger, fries and drink included. As me and Nash are currently on tight budgets, it was worth a try! I ordered the BBQ Bacon and Jalapeno Cheeseburger. It wasn’t as massive as some of the other bugers we’ve had recently, but it was pretty delicious. It was exactly as it’s name described. 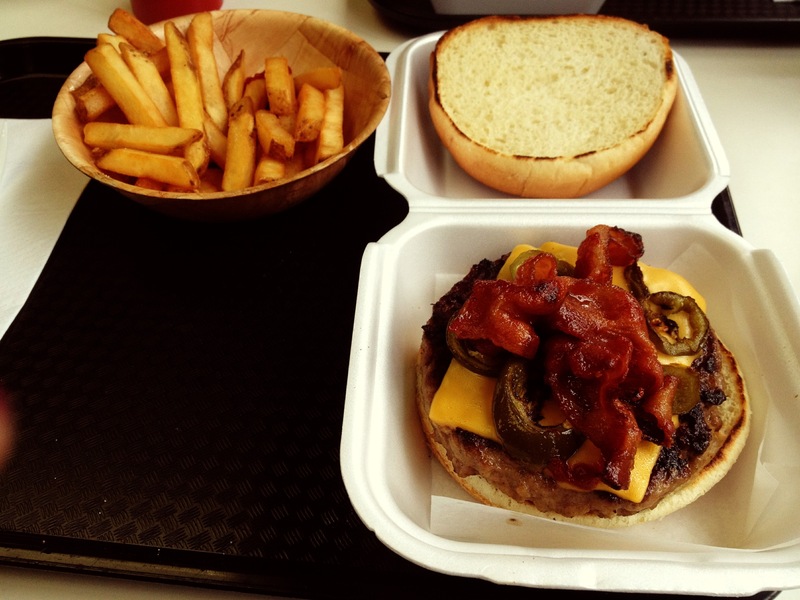 A burger with bacon, jalapeno, cheddar cheese with the perfect kick of BBQ sauce. I enjoyed the kick the peppers gave and the BBQ sauce was nice and tangy. It was a simple burger, but it was definitely more flavourful than some of the other ones I have eaten lately. Plus, this was a meal for under $10. The fries were made skin-on and gave it a lovely crunch texture. They were warm and tasted fresh. The only thing wrong with them was that they weren’t served salted. Although that was easily fixed since each dine in table had salt, pepper and vinegar for customers to season their food to their liking. I had a pleasant dining experience at The Wing Company. The staff was friendly and I’ll definitely be back to try some wings next time!